At a glance, health care reform seems like the kind of issue on which self-interest has a substantial role to play in shaping public opinion. For those with pre-existing conditions, who lack insurance, or who face lifetime limits on coverage, the reforms have the potential to be worth many thousands of dollars. And there are of course non-material costs and benefits at stake as well. In a recent New York Times article on Oregon’s lottery-based Medicaid expansion, for instance, one newly insured father explained that “I feel like a different person,”and added that “I was pretty grumpy all the time before.” Employers, insurers, hospitals, medical professionals, taxpayers, Medicare recipients—they all have a substantial material sake in health care reform as well. But from public opinion data, does self-interest appear to be an important influence on Americans’ health care reform attitudes? And how (if at all) did its role shift during the salient, polarized debate that began soon after President Obama took office? The Figure just below presents the results for each of the independent variables, with the vertical lines indicating 95% confidence intervals. The red horizontal lines indicate zero. Notice that each plot has its own y-axis. As a reference point, President Obama’s speech on health care to a joint session of Congress was in September 2009, or month 9. Month 12 is December of 2009, when the Senate passed health care reform after highly publicized deals with Senators Ben Nelson and Joseph Lieberman. In month 15—March 2010—the Senate bill was passed by the U.S. House of Representatives and signed into law. November 2010, when the Democrats lost control of the House of Representatives, is month 23. From the intercept plot, we see that the baseline respondent becomes slowly less likely to think health care reform is good for the country. Turning next to the panel labeled “Medicare,” we can see that at the height of the debate, respondents on Medicare were slightly more likely than others to think health care reform would be good for the country as a whole. Still, the effect is substantively small and it dissipated quickly. Medicare respondents were not especially concerned about the cuts to Medicare Advantage, but nor were they overwhelmed with the end of the “donut hole” in prescription drug coverage. The story for Medicaid is broadly similar, with hints of a slight positive effect that didn’t persist. With respect to age (measured in years), as people get older, they are less likely to think health care reform is beneficial for the country, a relationship that grew in October of 2009 and then slowly waned in 2010. From the perspective of self-interest, we might expect people who are less healthy to think better of health care reform, as it is more likely to benefit them in the short-term. In each survey, respondents indicated their self-assessed health using five categories that varied from “excellent” to “poor.” This measure is not especially predictive, reinforcing a finding that political scientists have seen in policy arenas for decades: self-interest is not a central or direct predictor of most political attitudes. That conclusion is also on vivid display in the next panel, which illustrates the relationships for those who lack health insurance. Yes, in the fall of 2009, those without health insurance were somewhat more likely than others to think health care reform was a good idea. But that sentiment did not seem to last, and it was never sizable. Here on stark display is the central political challenge of the 2009-2010 health care reform: the core constituency to be helped by the reform was not especially supportive of it. Respondents’ race and ethnicity did come to matter as the debate proceeded, a fact which will be of little surprise to frequent readers of this space or of Michael Tesler’s research on health care attitudes. As the debate unfolded, Hispanics and African Americans appeared increasingly supportive of health care reform relative to non-Hispanic whites. Even so, the single strongest predictor of perceptions of health care reform is partisanship, even when it is measured with three coarse indicators for “Democrats,” “Independents,” and “Republicans.” Independents and especially Republicans became less and less likely to view health care reform favorably as the debate unfolded, a point that Douglas Kriner and Andrew Reeves have made as well. In fact, in a future post, I’ll show just how strong this correlation is in substantive terms. (A teaser: by 2010, partisanship was almost as predictive of perceptions of health care reform as it was of Presidential vote choice in 2008.) For Republicans especially, health care reform has three broad periods, with a “honeymoon” phase of more muted opposition giving way to more pronounced opposition in August 2009 (month 8). That second phase lasted until January 2010, when opposition grew stronger still in the wake of the Senate’s bill. Notice, too, that when there are clear shifts in sub-group opinion, they tend to follow salient events rather than shifting party messages. Health care reform is an issue with an unusually broad reach. 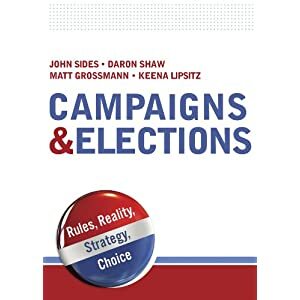 When voters think about the issue, though, we are thinking about it primarily through the lens of partisanship and groups, not through the lens of self-interest. Ultimately, politics may well be a fight about who gets what, but that is far from language in which voters make sense of these debates. Thanks for posting. As you know, I agree with your general point about self-interest being overrated as a political motivation; I think it comes in more indirectly, in that one’s personal experiences influence one’s sense of what is good for the country and even what is legal or constitutional. 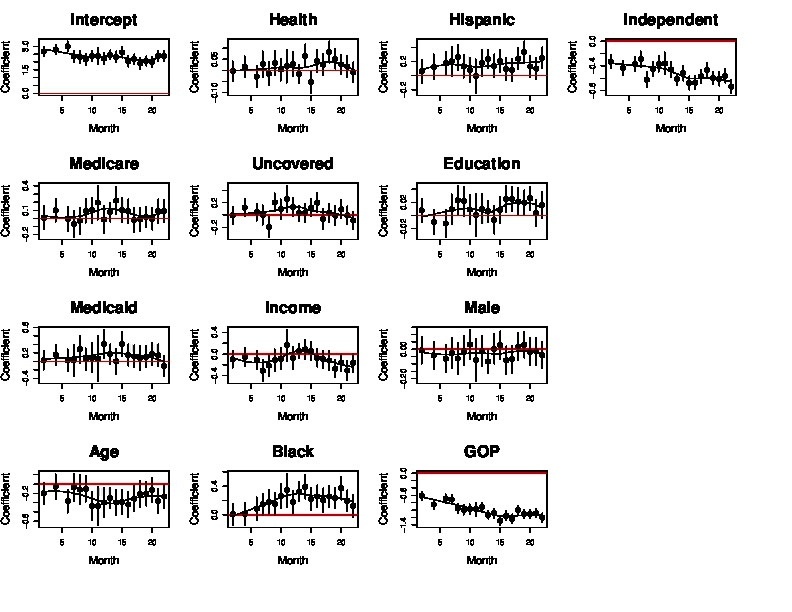 On health care in particular, analysis of poll data from 2000 and 2004 (click on the link and go to Figures 2 and 3) show only a small amount of variation in attitudes from state to state (compared to what we see in maps of vote choices) but huge differences by age and income, which is consistent with the “who benefits?” approach to policy analysis. It would be interesting to put together data from a bunch of more recent polls and repeat the analysis, also breaking things down by partisanship. You might take a look at the working paper that Doug Kriner and I have that Dan references (http://people.bu.edu/areeves/papers/healthcare.pdf). We standardize nearly 130 polls during the Clinton and Obama administration that ask about health care. Surprisingly, we don’t find much sustained influence of income on attitudes toward health care in either period — party really dominates. We have yet to exploit state-level variation in attitudes, but that would be an interesting next step.